A 4 x 4 inch square corner pets care full color magnet is a perfect pick for a high visibility brand building campaign for businesses dealing in pet care services including pet sitting businesses, animal care providers, pet food stalls and much more. These cute custom magnets will keep your name in front of your clients at all times thereby increasing your brand recall value. Low cost and light weight, these custom magnets are also well suited for direct mailer campaigns and for handing out during mass events like tradeshows, store promotions, seasonal campaigns and the like. Custom magnets also make excellent personalized gifts for friends and family, appreciation gifts for employees and freebies during marketing campaigns. You can also use it for pet adoption awareness campaigns in schools and communities. Advertisers seeking large scale promotions can always order it in bulk and gain benefits in the form of discounts and lowest customization fee along with free shipping, free design and art set up offered on all orders. Though pet care business promotion is still largely promoted by word-of-mouth publicity, a range of innovative promotional tools are being used by marketers to reach out to their target audience these days. 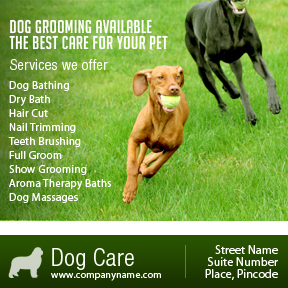 From business cards to custom magnets and online promotions, advertisers are not leaving anything to chance when it comes to getting connected with potential clients and getting the word out about their pet care services. Pets make wonderful companions and whenever something goes wary, often the pet owners will get panicky as they may not have the contact information of pet clinics or vet services in hand. However these custom pet care service magnets will ensure that timely vet care is always on the offer. Custom magnets make screaming billboards for your brand. Imprint your logo, artwork or business message and hand these out to your customers at tradeshows and events. These delightful refrigerator magnets not just promote your brand and services but also double up as excellent fridge art for the recipients. People will love to take home these free custom magnets and flaunt these on their fridge doors and whenever guests pass by their refrigerator your brand logo will instantly grab their attraction. Your recipients will love to hang up their little shopping lists or junior’s soccer schedule and every time they check on these daily reminders, your logo and business message too grabs their attention. Bright and large, these pet care magnets are a rage among pet lovers for all the useful pet care information that these carry. The massive imprint area and the colored background will ensure high visibility against any surface. Office workers will keep these custom magnets on metal desks and file cabinets and every time they need a pet care service for their furry friends, they will have all the information that they are seeking right in front of their eyes. Designed to last long, people love to retain these brightly colored fridge magnets in their homes for long. Kids can spend hours shuffling and rearranging these as per size or colors, giving the fridge door, a stylish appearance every time. Durability: Custom magnets last long and retain their sheen and color for many years. Great Value for money: Cost effective to print, custom magnet displays your business message indefinitely to give a long term brand exposure. Effective: Custom magnets enhance brand recognition and ensure steady sales.